You're on your way to an important event and you get into your car. You get out your key, insert it into the ignition, and the key won't turn! What's going on here? Relax. This happens to people all the time. There are several different causes for a key that won't turn in the ignition. Let's go through them and identify the causes of and some solutions for your problem. Here is RepairPal's simple guide to help you figure out why your key won't turn in the ignition. Safety first! Before you start troubleshooting this problem, make sure that your vehicle has the parking brake applied. Let's first rule out any problems caused by components not directly related to the key and the ignition switch. 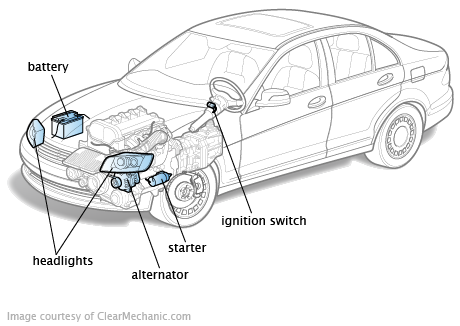 Many higher-end vehicles have sophisticated electronic ignition systems. Without power flowing through the electrical system, the key may not turn. Verify that your vehicle has power and that the interior lights come on when you open the door. If not, this could be a battery problem. Solution: Have your electrical charging system thoroughly checked. Unless your battery is very old and you live in an extreme climate, there may be a more complex explanation for why the battery died. Loose or worn wiring, a bad alternator, a worn belt, or an electronic component could be the cause of your dead battery. Find out before you replace the battery, or you may find yourself with another dead one very soon! Most vehicles have a locking steering column that activates when you take the key out of the ignition at the end of each drive. Occasionally, the steering column can lock in a position that applies pressure to the ignition switch, and prevents the key from turning when you insert it. Solution: Grab the steering wheel and try to move it back and forth. There should be a small amount of play in the wheel when the steering is locked. Gently turn the key in the ignition while you slowly jiggle the steering wheel back and forth. If this is the cause of the problem, the key should be able to be move out of the locked position, unlock the wheel, and then start the vehicle. For safety reasons, automatic transmissions are designed so that you can only start the vehicle when it does not have a gear engaged. This means that unless the gear selector is in Park or Neutral, the car won't start. You may have forgotten to shift into Park the last time you drove the vehicle. If it was left in gear, your transmission will not allow the key to turn. Solution: If the transmission lever was left in gear, move the lever to Park or Neutral. If the lever appears to be in Park, try moving the lever a little in case it is not fully seated in gear. See if the key will turn and the vehicle will start. Take a close look at your ignition key. Is it perfectly flat? If not, it may not line up correctly with the ignition lock's internal mechanism, and the key will not turn. In some extreme cases, you may not be able to fully insert the key. Do NOT force it into the lock! Solution: Try a spare key if you have one, or place the key on a block of wood and use a wooden or rubber mallet to gently flatten the key. Avoid hitting any plastic or electronic components. When the key is flat, try starting your vehicle with it. If your car is an older one, and you are making several trips each day, your key can become worn from the thousands of times it has been inserted and turned in the ignition. Over time, the key can lose the sharply defined peaks and valleys that identify it to the lock cylinder. Sometimes the teeth can get broken off, damaging the key and rendering it inoperative. At a certain point, the contours of the key will no longer match up to the lock pins. The key will not turn. Solution 1: Examine your key to see if it looks worn. Compare it to the other key that came with the car. If you are like most owners, you do most of the driving and use one particular key all the time. There's a good chance that your second, little-used key will retain its original cut. Try starting the vehicle with the second key. If it works, then you need to have a replacement key made. You can give the dealer your car's VIN or the key code that might be with your spare key, if you have it. Don't delay on making the replacement, because if you lose the only remaining key, you will have a serious problem on your hands! Solution 2: If you are away from home and your second key when this happens, you can try pulling the key out of the ignition lock very slightly, by about a sixteenth of an inch, before you try turning it. If you're lucky, this may allow you to engage the lock pins, turn the key and start the vehicle. Do you keep your car keys in your pocket? Do you use your key as a knife to open packages that are secured with tape? If so, lint from your pocket and adhesive from the packing tape (and the dirt that it attracts) can build up on your key. If it is bad enough, this buildup can keep your key from matching up properly with the ignition lock components, and the key won't turn. Solution: Take a close look at your key and make sure that it is clean and free of extraneous material. Clean it with some rubbing alcohol or Goo Gone and a lint-free cloth, then dry it thoroughly. Try the key in the vehicle to see if it now works. If you have the keys to more than one vehicle, it can be easy to confuse which key is which. You may simply be inserting the wrong vehicle's key into the ignition lock. Solution: Use the correct key! You might have debris inside the ignition lock mechanism that is preventing it from turning when the key is inserted. This may have been transferred into the lock from a key that had foreign material attached to it. This debris can cause the ignition lock pins to not line up correctly when the key is inserted, and the key won't turn. Solution 1: Take a look inside the lock with a flashlight and check for any debris that is in there. If you see something suspicious, use a can of compressed air with a straw attachment to get into the lock and blow the foreign items out. Just use a few short bursts - don't overdo it. Another option is to spray a cleaner like WD-40 into the lock cylinder, then insert the key and gently try to turn it. Remember to wear eye protection when you do this. Solution 2: If you are stuck somewhere without access to any of the above-mentioned items, you can try sliding the key in and out of the ignition lock several times, and then try to turn the key. This may move the debris out of the way and let you get the car started. The inside of your ignition lock has several rows of spring-loaded pins that match up with your key when you insert it. This is what allows the key to turn and thereby start the vehicle. The pins can get stuck or out of alignment, and the springs can also stick and may weaken over time. Your key won't turn. Solution: A small hammer can be used to very gently tap the ignition lock cylinder, in hopes of loosening or resetting the pins that may be out of alignment. Take it easy here - if this does not work, it's time to have your mechanic take care of the problem. The lock cylinder may need replacement. If it does, the new lock cylinder will likely come with a new key to operate it.